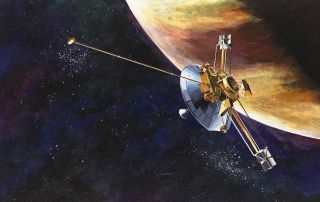 Artist's illustration of NASA's Pioneer 10 spacecraft approaching Jupiter in late 1973. Two huge, Apollo-era NASA computers and more than 300 data-recording tapes were found in the Pittsburgh basement of a dead engineer in late 2015, according to media reports. In November 2015, a scrap dealer was invited to clean out the basement of the recently deceased IBM engineer, who did some work for NASA at the height of the Space Race, Ars Technica reported. The dealer found about 325 magnetic data tapes and the two giant computers, both of which were marked "NASA Property." The scrap dealer contacted NASA to inform the agency of the find, and NASA's Office of the Inspector General (OIG) performed an investigation. Ars Technica obtained the OIG's report via a Freedom of Information Act request. "Please tell NASA these items were not stolen," the engineer's heir told the scrap dealer, according to the OIG report. "They belonged to IBM Allegheny Center, Pittsburgh, PA 15212. During the 1968-1972 time frame, IBM was getting rid of the items, so [the engineer] asked if he could have them and was told he could have them." The relevant names have been redacted in the OIG report. NASA officials told the deceased engineer's family that the agency did not need the computers back. After further investigation, an agency archivist determined that 93 of the tapes contained data from Pioneer 10 or Pioneer 11, flyby missions to Jupiter and Saturn that launched in the early 1970s. A few of the other tapes recorded data from the Pioneer 8, Pioneer 9, Helios 1 and Intelsat IV missions, but most of the recordings — about 215 of them — could not be identified. The archivist recommended that all the tapes — which were moldy and in generally poor condition — be destroyed, because they didn't contain anything of historical significance. You can read the NASA OIG report here and the full story at Ars Technica here.